Immigrants rights supporters celebrate as Measure 105 is defeated decisively during Tuesday night's general election. Opponents of Measure 105 went from nervous to jubilant in a quarter of an hour Tuesday night. The measure, which would have repealed Oregon's 1987 law limiting use of state and local law enforcement resources to enforce federal immigration laws, lost big in the Nov. 6 general election, 62 percent to 37 percent. Opponents of the measure, gathered in a room below the First Congregational United Church of Christ on Park Avenue, were pleased with the results. Andrea Williams, chairwoman of the No on Measure 105 campaign and executive director of CAUSA, the immigrant rights organization, felt the group had run a strong campaign and had key endorsements from law enforcement, civil rights groups and corporations like Nike. She said they were surprised how many people turned out to canvas in places like Medford. "If 105 is defeated, it will prove that Oregonians believe in fairness and looking out for our neighbors, and that racial profiling is wrong," Williams said. "This will be the wind behind our sails if Measure 105 is defeated. "This is personal to a lot of us because we have a lot of immigrants on the campaign, so if the law were to be taken away it would impact families that we work with." 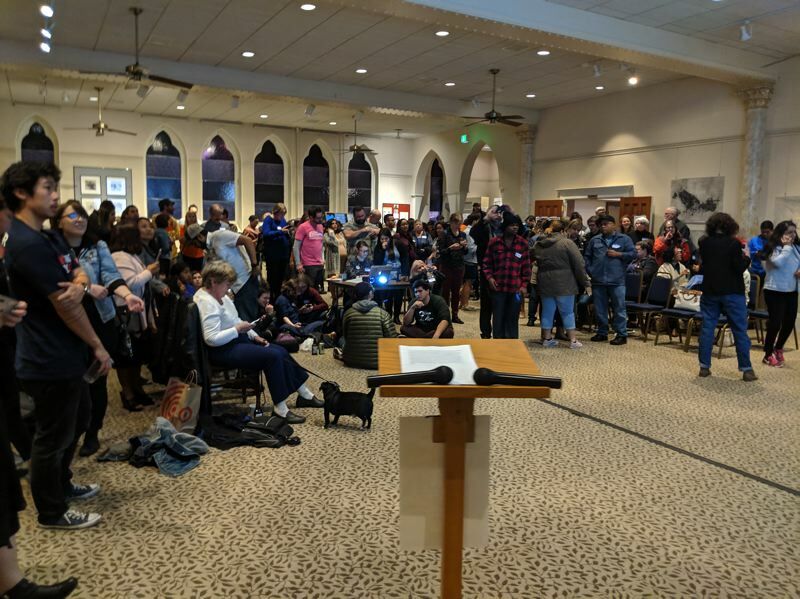 When it became clear that the measure would be defeated and the sanctuary state law would remain, the crowd gathered for an election night party cheered. "In 2014 we faced the same anti-immigration organization, with the same strategy to single people out based on what they look like and where they come from," Williams told the crowd. "We learned the hard way just how large and organized our opponents could be. After that loss we were in pain, it was a horrific night for immigrant families. We came out of that loss stronger and more motivated than ever before." She said they built the coalition through One Oregon. "This time we were prepared, we were battled tested and we ran a phenomenal campaign. And we won. "This will not be the last time we are attacked at the ballot, but today we celebrate," Williams told the crowd. When the No on 105 campaign party moved to the Portland Hilton Downtown, joining Democrats and Gov. 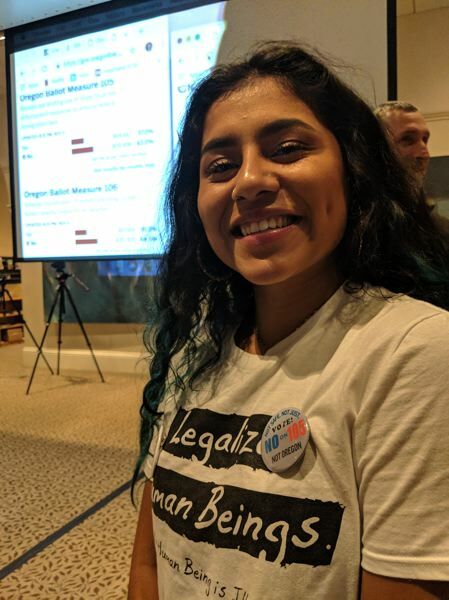 Kate Brown's celebration, Yomaira Tarula, an intern with CAUSA and an ethnic studies major at the University of Oregon, was ecstatic, dancing around the room. "I am so happy, and so proud to be an Oregonian," Yarula said. "We are ahead by more than 30 percent, that is amazing. I was expecting a close number. But this really shows that people were well informed and were willing to vote against this anti-immigrant measure." The 21-year-old knocked on doors in Lane and Marion counties, asking people to vote against the measure. 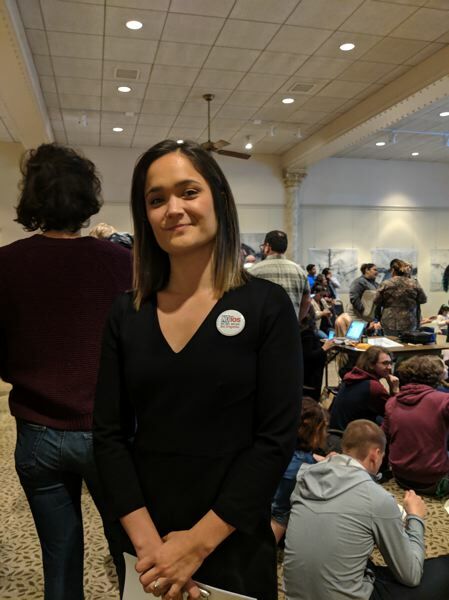 "I think we have a progressive moment going on and I hope we continue that, and in the next two years we're going to show up for who we are as a state," Tarula said. "I think we're safe for the next two years, but I don't doubt that OFIR (Oregonians for Immigration Reform) will attempt to disrupt the Oregon democratic way, but that doesn't mean we're not going to fight back. This is not the Oregon way. We're not going to tolerate these anti-immigrant sentiments." David Rogers, executive director of ACLU of Oregon, said he was "really proud of Oregon." "Voters rejected the politics of fear and hate," Rogers said. "The was making Oregon a testing ground for anti-immigrant sentiment and policy, and we demonstrated that those politics don't work." Rogers said the No on 105's coalition was big. "And what we've built here is going to continue to exist, because our work is not over." At the Hilton, there was a parade of speech makers celebrating wins by Democrats. Williams and Marquez gave their speeches again over the roar of chattering party guests. 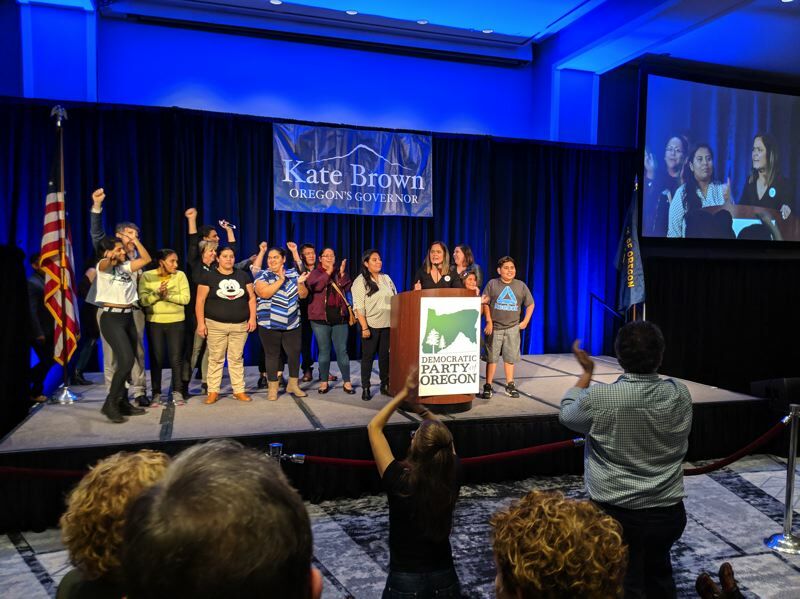 "We look forward to work with our elected officials to make Oregon a more inclusive state for all people, an equitable state for everyone," she said. Williams said the work is not over. "We want to build out that coalition even stronger behind an inclusive agenda."